sweet dram, then bitterness in the finale !! vanilla scent then white fruit, and buttered caramel !! it is soft! I really enjoyed a sample of this a few years back which prompted me to buy a bottle. i previously noted this young grain as ‘one that will make you smile’. N: With its light peach & pineapple tones, it reminds me initially of the Mackmyra Bruks i’ve been enjoying [batch Aug ’15], but as the bottle settles it’s the sweet and soft-textural cereal notes that appeal with luscious layers of truly splendiferous, savoury-sweet vanilla cream. Pleasing, simple, the smiles are back. T: It starts a tad sour but just about maintains a sweet<>sour composure. Water reveals a decent [rum-like] barley spirit in active [1st fill? ], bourbon casks that simply haven’t had the time to impart any complexity. Balance is good as both spirit and cask temper each other, but i soon become weary of the raw mix. Fibrous into the finish. F: Very little, of course. Moderately spirity and dry with a return to vanilla, albeit less splendiferously as greener notes survive along with the bourbon oak. C: Overall then, a simple yet well crafted young grain with an ideal breakfast nose, but after that the smiles swung to struggles. So much so, I donated the bottle to last years NYE festivities for finishing, but it even survived the revellers and returned home! A very interesting and absolutely not negative experience. Barrel without any Brennereicharakter. At first you think of the standard Jameson. Distinct vanilla, some caramel and honey. In the background the scent of an old granary. A touch of fermented apples. Clearly Irish. After this flavor you may not believe how incredibly easy this whiskey is. The alcohol is pleasantly warming, but never spicy, after the whiskey comes along at first almost watery. Then comes a light honey sweetness with clear oak notes, which are absolutely not unpleasantly bitter. The alcohol warms throat and chest, the sweetness and the oak remain surprisingly long after everything started so easily. At the end a piece of bread remains in the mouth including the sweetness of saliva converted starch. N: Its young but its also light and delicious, For a young single grain, its superb. T: Not at all as astringent as i’d expected. It has an appealing light turpentine varnish on the nose and a palate that will make you smile. F: Fresh vanilla to die for. C: Very clean, simple, fun and honest whiskey worthy of a £27 purchase. 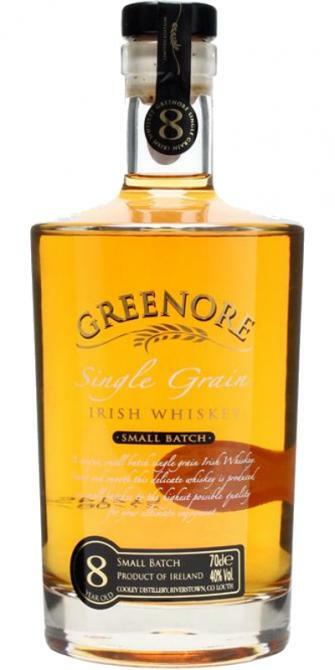 A very light whiskey, this Greenor. The aroma is strong and brings lemon and peach flavors with it. Very light and sweet in the taste with a fresh citrus note and a hint of marzipan underneath. The finish is very long and beautiful - the citrus notes are preserved for a long time. That a grain whiskey with only 8 years can be so delicious! This whiskey makes it easy to like it. Easy drinkable, but no complexity at all. Malty sweetness. Apples and pears. Linseed. Also some buttery notes. Light and clean. Subtle fruitiness. Slightly peppery later on. Not that long. Becomes bitter at the end. What is it that makes Irish whiskey so distinctive? The first time I tried this was tasted blind when a friend bought a bottle and asked me to tick boxes on a sheet. Whatever that aroma is, I like it - a lot! Well that Irishness is here in abundance, and there's barley and a fairly complex fruitiness that I don't get as peaches but as something more exotic. Can't place it though. The palate is very different and I agree on the hazelnuts, but I also get a little rubber balloon. Now, I'm particularly sensitive to sulphur normally and this balloon flavour would normally set alarm bells ringing but it is actually well-controlled and doesn't degenerate into sulphur at all. It's sweet, smooth, creamy and delicious.